I remember going to the State Fair in Indiana as a young girl. One thing I always looked for was the little maple leaf maple sugar candies. I couldn’t afford more than two or three, but I would savor them for months, breaking off a tiny piece to melt in my mouth. The maple flavor was intense and such a treat. This is the time of year when maple sap begins to flow. I wondered how our ancestors learned how to make maple sugar or syrup and the importance it had in their lives. I found some information that surprised me. 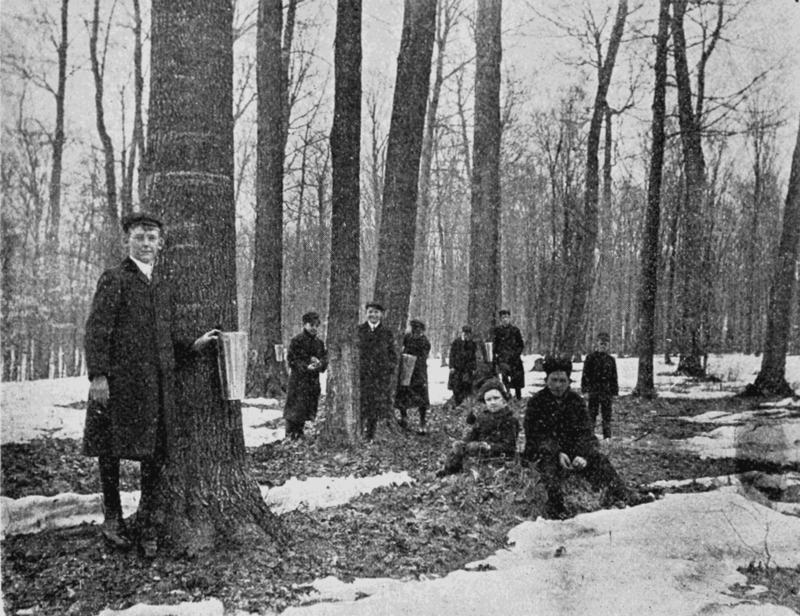 The early American settlers learned to harvest maple sap from the Native Americans like they learned many survival techniques. But, where did the Native Americans learn to cook the sap from the maple tree into syrup or sugar? There are different stories or possibilities. The one that made the most sense to me suggested the Native Americans watched the squirrels or other animals in the spring. They noted the sap flowing from injuries in the trees. The sap would harden into little icicles referred to as sapsicles. 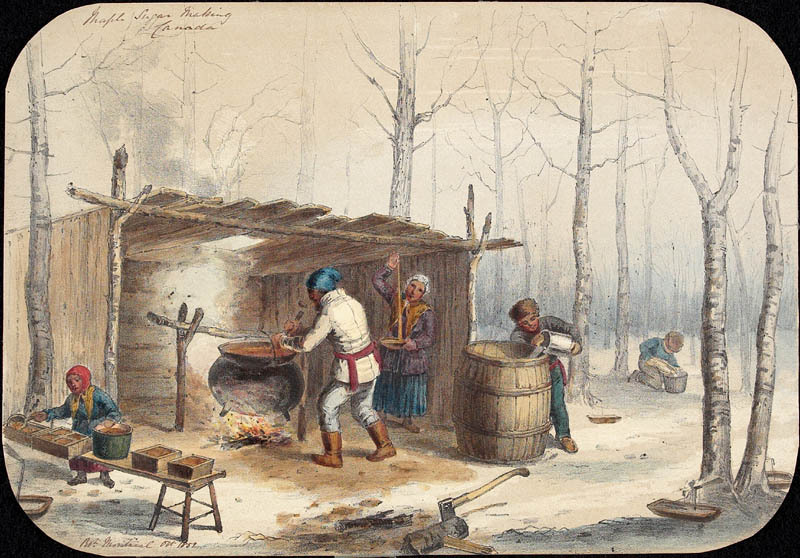 The Native Americans learned the of the sweetness and value of the sap and began to experiment with maple sap as a food. In the late 1700’s Dr. Benjamin Rush convinced Thomas Jefferson to help him promote the manufacture and use of maple sugar in place of cane sugar. Dr. Rush was appalled at the treatment of slaves used to harvest sugar cane. 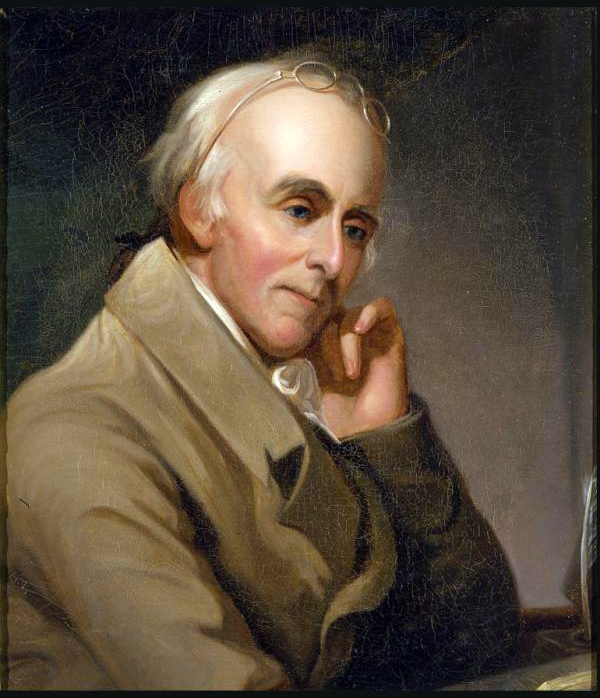 Together Rush and Jefferson encouraged people to plant maple trees and make their own sugar. Maple sap can only be harvested in late winter or early spring. The temperatures need to fluctuate between 20° and 40°. 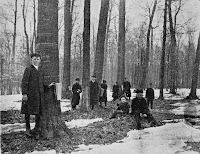 It takes one tree over five days to produce enough sap to make on gallon of syrup. The sap has to be harvested before the trees begin to bud, so the collection time is fairly short. When the temperatures were ideal, a hole was bored into the maple tree and a wooden spout placed there. A bucket would be hung from the spout to catch the sap. 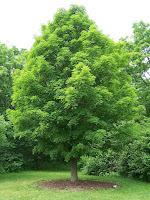 There are several types of maple trees that produce sap for syrup, but the sugar maple has the sweetest. in large cooking tubs and boiled down to make the syrup or sugar. The process wasn’t quick but the families with maple trees could produce enough sugar to last them for the year. Today, we still enjoy maple syrup with our pancakes or French toast. The process has been refined and improved since those early days. Now, they have a grading system for the quality of the syrup instead of worrying about having enough sugar for a year. Do you like maple syrup on pancakes? Have you ever seen any maple trees being harvest for sap? I have a maple sugar bucket that was restored by a gentleman my mother knew. I love the wood in this bucket, the rich color and beauty of the maple. 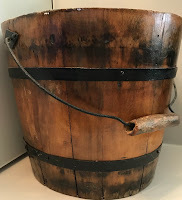 I wonder about the people who first used this bucket to gather sap to make into syrup or sugar. Nancy J Farrier is an award winning author who lives in Southern California in the Mojave Desert. She loves the Southwest with its interesting historical past. Nancy and her husband have five children and two grandsons. When Nancy isn’t writing, she loves to read, do needlecraft, play with her cats, and spend time with her family. Nancy is represented by Tamela Hancock Murray of The Steve Laube Literary Agency. You can read more about Nancy and her books on her website: nancyjfarrier.com. Living in Vermont for most of my life, the maple syrup industry is near and dear to my heart. 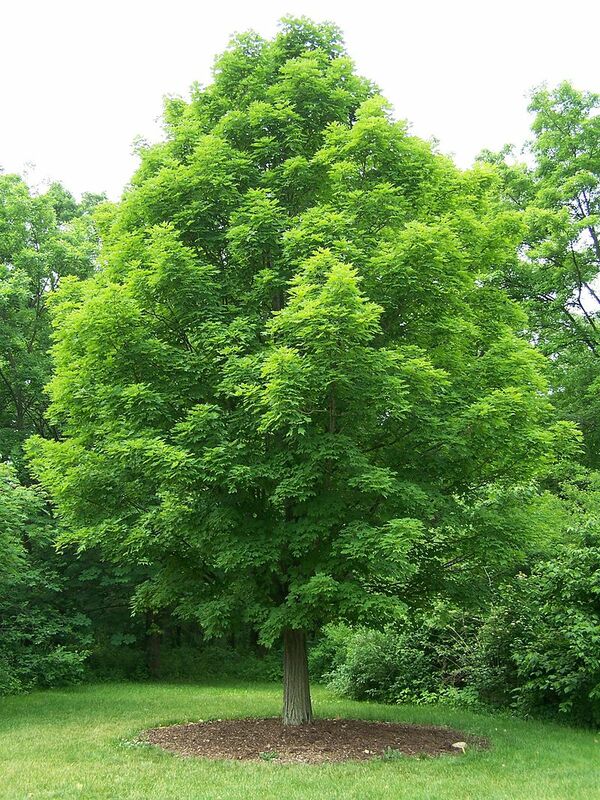 My father and brother used to tap our two huge maples and would either boil the sap down outside or, to my mom's chagrin in the kitchen. Chagrin because there was a lot of steam generated and if you weren't careful, the kitchen wallpaper would start to peel! In bigger operations, there are sugar houses with huge evaporator tanks. Nowadays people use plastic tubing in the bigger operations; they are left up all year long and have to be maintained. My favorite grade of syrup is B or C rather than the fancy top grades; they have a more distinct maple flavor and darker color. Thanks for the memories! Connie, thank you for sharing those insights. That is fascinating. Thanks for sharing this post. Living in the Midwest, I've never had the fortune to witness sap being drawn. I do enjoy maple syrup on my pancakes and waffles though. It's amazing the price of syrup isn't more, considering how little sap comes from each tree. I never watched the process, but I do love the syrup. Thanks, Vickie. I love your post and I love your bucket. Growing up in Texas, we had no wonderful syrup flowing from trees around my house. Thank you, Melanie. I do treasure that bucket. Such a rich, beautiful wood.